A data analysis algorithm that identifies and solves dangerous gaps in patient care before they result in an adverse event. A 4G, Internet-ready tablet, pre-loaded with disease management information and given to patients prior to hospital discharge. A one-button PERS device that combines GPS, accelerometer, geo-fencing, cellular response, an emergency call center, family engagement, and vital sign monitoring into one system. A mobile system that gives clinicians in the field direct access to evidence-based skills and procedures, patient handouts, drug monographs, and customizable skills and procedures. A compliance dashboard to give executives real-time information on individual clinician accuracy and appropriate reimbursement over time. A communication system that directly links hospice nurses with pharmacy services. These unique and divergent new technologies were featured at last week’s Home Care and Hospice Link conference. They demonstrate the commitment of technology inventors and entrepreneurs to help home healthcare providers meet the Affordable Care Act’s Triple Aim goals: improved patient outcomes, lower costs, and enhanced patient experience. Not every profiled product will be useful to every home healthcare or hospice provider. Look through the headings below, however, and find at least one or two worthy of further investigation. Twenty-five technology developers submitted innovations earlier this year to the Lincoln Healthcare Group’s first annual “Luminary Showcase” competition, which culminated during the organization’s Chicago event last week. Working weeks in advance, a panel of three judges narrowed the field to six finalists, who were invited to present their innovations during the event and submit to pointed questions from the audience and a panel of three expert judges. The favorite, by a razor-thin margin .25 of a vote, was ClinLogica Oversight™, designed by HealthWyse co-founder Andrew Braunstein. Right on the home health veteran’s heels were Health Recovery Solutions and GreatCall, Inc. Not far behind were specialized products from Quality in Real Time, OnePoint Patient Care, and Elsevier (Mosby). ClinLogica Oversight™ overlays EMRs to provide a wealth of analyzed information to care managers. By using clinical data intelligence to identify downside risk and optimize clinical measures, the software enables improved care. Oversight integrates clinical data with evidence-based standards to identify and manage gaps in care, reducing risk and errors. Using ClinLogica’s web dashboard, providers successfully drive actionable change. Applying clinical data intelligence to real-time EMR patient data, ClinLogica Oversight™ delivers actionable information to practitioners in the form of three main components: adverse event risk mitigation, adverse drug event mitigation, and information sharing. Gaps in care are significantly reduced with ClinLogica’s real-time clinical analysis. Use of ClinLogica data drives better care, better transitions, and better outcomes at lower costs. As an overlay to EMR data, ClinLogica Oversight™ enables cross-continuum collaboration. As an element-based system, it breaks down document boundaries and allows all members of the care team to work on a common framework with a patient’s problems, measures, and plans universally shared. ClinLogica Oversight was rolled out in 2014. It is provided as Software as a Service with a Per Member / Per Period pricing model..
Health Recovery Solutions provides hospitals, ACOs, home health agencies, and insurance companies with patented clinical software to prevent readmissions and empower patients to improve their lives. HRS provides a cost-effective solution that not only saves on Medicare reimbursement, but also improves delivery of care for high risk patients. While in the hospital, patients are provided a 4G, internet-ready tablet pre-loaded with HRS software. Patients utilize the tablet to educate themselves on their condition via instructional videos, diet information, and teach back quizzes. At discharge, patients are sent home with the tablet along with integrated wireless monitoring devices (including blood pressure monitors, pedometers, digital scales, and pulse-oximeters). Patients are reminded daily to enter important data such as medication compliance, blood pressure, weight, physical activity, symptoms, and diet. The data is sent to the cloud in real-time where HRS predictive analytics and proprietary algorithms alert clinicians and caregivers to a patient’s condition. In cases where that condition is deteriorating, care teams may intervene. The tablet, 4G service, and HRS software were released in 2013 and will be provided to home care agencies and hospitals for $100 per month. GreatCall presented "5Star," the first 3rd-generation personal emergency response system, explaining that 1st-generation PERS offered the familiar pendant that can signal an emergency response center through a nearby base station, and that 2nd-generation PERS added cellular connectivity and GPS location information. GreatCall’s 5Star mobile PERS system adds fall detection and other features, including automatic emergency call initiation that occurs prior to obtaining a GPS fix, thus avoiding the 30-60 second delay that typically occurs when location is determined before the call is placed. The system runs on multiple mobile devices, including the simple Jitterbug line of cell phones. The most popular is a wearable (pendant or wrist), proprietary device, called the "Splash," approximately half the size of a flip phone. It features built-in activity sensor technology and one touch, immediate, delay-free access (and auto-alerts) to the company's own emergency response call centers, which are coordinated by NAED certified agents, or 911. The system also offers Bluetooth connectivity to in-home vital sign components and access to a 24/7 telehealth center for medical consultations "on demand." GreatCall Link infrastructure supports personal privacy and secured data sharing. Link apps provide invited family caregiver with updates (web, iOS, Android) about the 5Star user, including device status and compliance, activity levels, incident alerts, location, key location check ins, geo-fencing alerts and summaries with suggested interventions generated by a proprietary application of artificial intelligence software. Distant family members, for example, know when the device's battery is low and can call the loved one to remind him to charge it. 5Star's Link software also offers alerts and data for professional caregivers. The company reports that the system has multi-year usage over 80%, on the high side for this type of product. Currently, the company adds, 40% of new users pay extra for optional access to telehealth services, and 33% seek consultations monthly (for blood pressure issues; chest, back and abdominal pain; diabetes complications; medication issues; etc.). Emergency room visits by 5Star users have dropped 12.5% over the last six months. 100% of all direct-to-911 and dropped calls are followed up to ensure the caller’s issues were addressed. Future plans include smaller, more easily wearable devices and additional activity monitoring, predictive modeling and enhanced connectivity capabilities as PERS continues to converge with telehealth and patient medical monitoring. 5Star Splash will sell for $50, with a monthly fee set at $19.99. Both prices can be reduced for volume purchases. Home health nurses and therapists with one year of experience can provide care like a 2-year veteran when best practice reminders are at their fingertips. 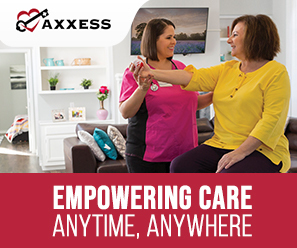 Mosby's Home Health Care was described as the first of its kind, offering mobile access to evidence-based skills and procedures tailored for home healthcare and convenient competency management. Developed by global information provider Elsevier, Mosby's Home Health Care provides information that nurses and other staff need most: hundreds of patient education handouts, drug monographs, and customizable skills and procedures. This information, combined with Mosby's Home Health Care's competency management functionality, helps home care organizations evaluate performance across their staff, standardize practice and increase safety of care. For the nurse, the need to obtain clinical information near or at the point of care in the home. For the organization, ensuring that best practices are distributed throughout the organization and there is a defined standard of care. Elsevier is a leading information solution provider for professionals globally, providing over 25% of the world’s clinical content to over 20 million healthcare professionals. The product was released in 2014 and will be priced on a per-clinician basis. Quality In Real Time provides solutions to post-acute providers regarding compliance, coding, OASIS Review, and Quality Assurance. The Long Island, NY company also provides Financial Services, Revenue Cycle Management and Clinical Consultative Services, such as operational review, HIPAA Compliance, QAPI support, accreditation preparation, policy and procedure manuals, and clinician education. The innovation submitted for judging, Compliance Dashboards, provide executive level information regarding compliance, turnaround times, ROI of services provided by the company, and real-time graphs of key indicator data. Dashboards show the agency the path to individual clinician growth and accountability. QIRT gives them the tools to monitor accuracy, timely submission, and appropriate reimbursement over time. The Dashboards are exportable, allowing data to be utilized in the way the agency chooses. Rolled out in 2014, the product will be provided to QIRT customers at no additional charge. OnePoint Patient Care is a leading hospice pharmacy. Over the years, timely ordering and delivery of medications for terminal patients has been a problem due to multiple steps, paper shuffling, and miscommunications. The company decided to automate the process and provide the automated system to its customers at no charge. OnePoint's new Patient Care App, rolled out in 2014, allows clinicians in the field the ability to communicate to the OnePoint pharmacy from any mobile device or PC. Seamless information integration allows for real-time updates to track orders, make changes and review prescription profile information. Describing its Patient Care App as a game changer for hospice providers, the company explained that the tool offers real-time data integration between clinicians in the field and the OnePoint pharmacy, eliminating extra steps from the medication management process. Clinicians know the status of an order in real-time and cane issue prior authorizations and make informed clinical medication decisions. Using OnePointRx, an online suite of clinical and financial reporting tools, clinicians see therapeutic alternative considerations, which simplifies ordering and profiling information for new orders and refills, including controlled substances. The tool will be made available to OnePoint Pharmacy's 165 hospice customers at no additional charge. Editor's note: information for this article was compiled from company materials, including web sites and documents submitted to the Lincoln Healthcare Group's Home Care and Hospice Link conference, and from live presentations made during the Link conference, where the author was a member of the three-judge panel. Though some attempt was made to soften the promotional language in speeches and submitted documents, some vendor claims have been left intact without independent verification. Therefore, this report must not be taken as an in-depth, critical product review nor an endorsement of any of the products submitted by the six finalists. (That said, I was impressed by all of them and highly recommended you look into the ones that apply to your service lines.) Some of the 19 other submissions are also worth a look and will be highlighted in coming weeks.